A prefect coffee grinder that each kitchen need. 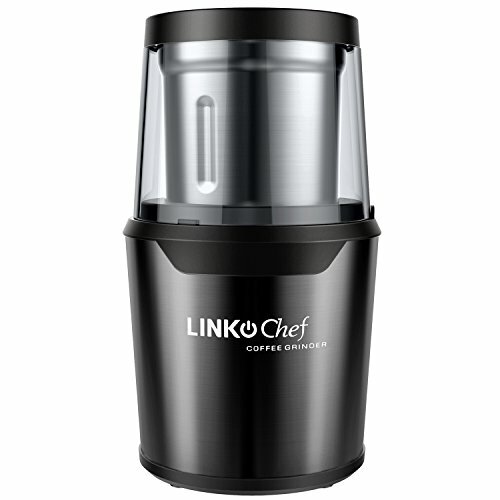 Now the new design LINKChef CG9230 coffee grinder is coming! The fashion design catch everyone's eyes. Metal design makes the product look very advanced. 304 stainless steel detachable bowl make it easy to clean. The double lids design not only keep it safety but also keep your kitchen clean. New electric wire storage function is practical and convenient. Max 60g large capacity can meet daily usage requirements. If you find anything wrong about the product, please stop to use! And ask us for sales-after service. Please don't disassemble the product yourselves. ✔ Portable & Detachable Design: The container is portable and detachable design. Made with 304 stainless steel. Easy to clean, can remove the bowl and use water to wash it. Double lids will never make your kitchen or parlor messing. ✔ Powerful Grind and Large Capacity: 300W DC motor insure you can grind coffee beans, spices and lots kinds of nuts. Max 60g capacity can provide 12 cups coffee each grinding. it's enough to grind coffee for your family and friends. To have more time to chat with them instead of grinding the coffee. ✔ Safety Protection: There is an security switch that the coffee grinder only can work when you cover the outer lid. Double lids means double protection. ✔ Innovative Fashion Design: Metallic feel color design, catch everyone's eyes on you. The wire storage function makes the kitchen look simpler and easier to carry when you out of work and travel. ✔ What you get: Coffee grinder motor part, the grind cup with lid, the safety switch lid, 36-months warranty and 7*24 friendly customer service for peace of mind. If you have any questions about this product by LINKChef, contact us by completing and submitting the form below. If you are looking for a specif part number, please include it with your message.